Thanksgiving day is next week. The holiday that is all about kicking the eating season (sometimes called “flu season”) off in style. When I was growing up, the only meat I liked was turkey and we only had it at Thanksgiving and Christmas, so I have an emotional attachment to Thanksgiving and Turkey. And I DO enjoy real turkey that one day a year, Thanksgiving. I did some calculations and was pleased to see that the way I enjoyed Thanksgiving dinner as a kid wasn’t horrible, calorie-wise. We would have turkey, stuffing which was just bread, spices and butter, brussel sprouts with butter, mashed white potatoes with butter and small dinner roll (I never liked gravy). For dessert we had one small piece of pumpkin pie (I didn’t like the canned whipped cream). Total calorie count was 1,346 calories, including dessert. When I had my first Thanksgiving dinner in the U.S. I was floored by what was on the table. Turkey and gravy, yes, but everything else was completely new to me. There was this mashed orange stuff with brown sugar, maple syrup and marshmallows on it. There was a creamy dish with what looked like green beans in it, a tube of red jelly that still had the rings from the can on it (which I found out later was cranberry). Mashed white potatoes with cottage cheese stirred into them and a mountain of Pillsbury Dough Boy rolls. Oh, and, yes, gravy, in a pitcher. To finish it, there were three kinds of dessert and coffee with Bailey’s in it. 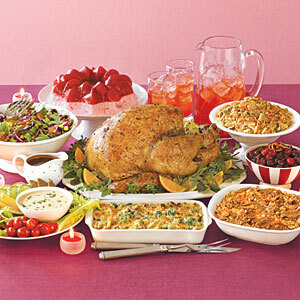 Back to the calculations: Average calorie intake for Thanksgiving dinner with dessert is 2,760. Just to compare, a Whopper combo meal with fries and a drink has 1,430 calories and a Big Mac combo is 1,580 calories. An average person walking a normal pace burns 250 calories/hr or on average 110 calories/mile. To burn off that 2,760 calorie meal you would have to walk for 11 hours or 25.1 miles. So, on Thanksgiving day, remember that you alone control how much and whatyou eat. Be smart and reach for the less calorie dense options. Fill your plate with veggies that still look like veggies and skinless turkey, leaving just a little room on the plate for high calorie foods. Also remember that the beverages can hide some pretty high calorie counts. Its also very hard for your body to digest all this food so make sure you give it a hand by taking supplemental digestive enzymes before the big meal. Grab an extra bottle of our Enzyme Probiotic Formula. Here is a delicious raw food dessert recipe that is extremely easy on your digestive system. 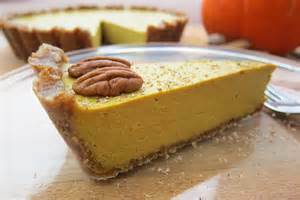 It’s a healthy alternative on Thanksgiving Day … gluten free, vegan and YUMMY! Blend pecans and dates in a food processor until sticky…add vanilla and sea salt and continue to blend until smooth. Spread into the bottom of a pie pan and set aside. Blend all ingredients in a Vitamix or high-speed blender until completely smooth. Fill the crust while the filling is still at room temperature. Place in the refrigerator to set for an hour or longer. Any extra filling is great to eat like pudding! ENJOY! !